Just 20 minutes north of Austin, Round Rock is known for historic sites, a walk-able downtown, great shopping, and professional and amateur sports offerings. Get to know this destination and plan your day trip from Austin with our guide to the top things to do, see and eat in Round Rock. Round Rock’s walk-able downtown is full of restaurants, shops, bars and more. Many of the businesses are located along Main Street and there is a free parking garage just steps away. During the summer months, the center of Main Street Plaza becomes a splash pad, so it&apos;s a favorite spot for little kids. Both Main Street Plaza and the nearby Centennial Plaza are home to regular events, such as movie nights, live music programming and holiday festivals. Arguably the most famous business in downtown is Round Rock Donuts. Opened in 1926, people from all over the world stop in to taste their delicious yellow donuts. Other downtown favorite restaurants include, Slapbox Pizzacheria, Star Coffee, Louisiana Longhorn Café and Urban Eat Drink. Round Rock is home to several parks, playgrounds and multiple golf courses. Open year-round, Old Settlers Park, is a 645-acre green space featuring walking trails, a fishing pond, Rockin’ River Waterpark, multiple playgrounds, fields for soccer, baseball, football, disc golf, cricket and more! Baseball fans love to root for the Round Rock Express, the Triple-A affiliate of the Houston Astros. The Dell Diamond is home to the team and is a family-friendly ballpark designed to allow for amazing close-up views of the action. The ballpark offers multiple food and drink vendors, a kids’ fun zone and event space that includes a swimming pool. Interested in Texas History? Chisholm Trail Crossing Park showcases commemorative plaques and bronze sculptures that depict Round Rock’s history as cattle crossing location along the Chisholm Trail. The limestone crossing is marked with ruts from the wagons that crossed the creek while on the cattle drive. The famous ‘round rock’ is near the park in Brushy Creek. Courtesy of Round Rock Premium Outlets. 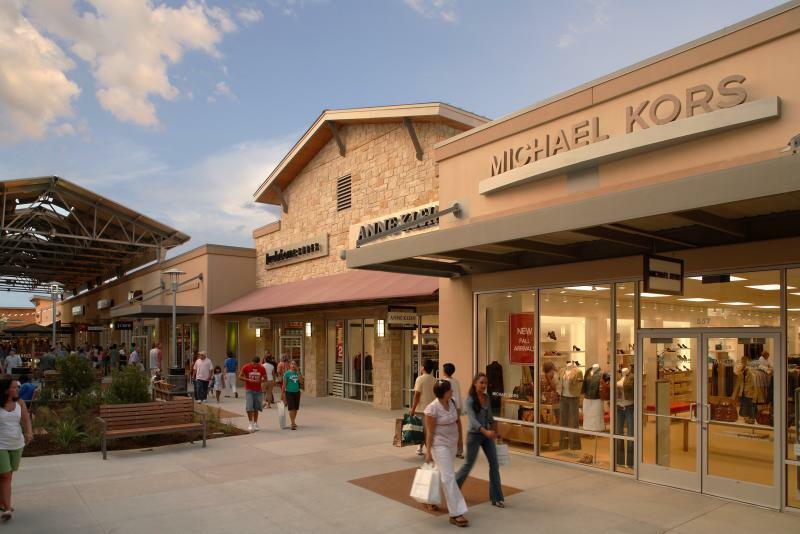 One of the area’s largest outlet malls, Round Rock Premium Outlets is a favorite for shoppers. Explore the 430,000-square-foot open-air mall that includes more than 125 designer and name brand stores. IKEA is also located in Round Rock, as are many locally owned shops and boutiques. Learn more this day trip destination from the Round Rock Convention & Visitors Bureau or by stopping by their Visitor Center, 231 E. Main St.